South Korean destroyer ROKS Choi Young, currently operating with the Combined Maritime Forces (CMF) counter piracy task force (CTF 151) participated in a counter piracy exercise with ships from the Japanese and US navies. Japanese destroyers JS Ariake and JS Setogiri and the US destroyer USS Bulkeley worked alongside the South Korean destroyer ROKS Choi Young (DDH-981). 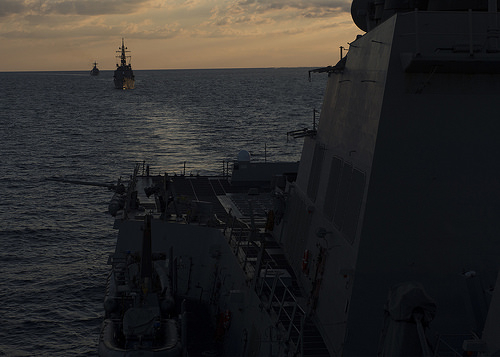 The Japan Maritime Self-Defense Force destroyer JDS Ariake (DD 109), middle, and the South Korean destroyer ROKS Choi Young (DDH-981) transit behind the guided-missile destroyer USS Bulkeley (DDG 84) during a combined counter piracy exercise. Events ran continuously throughout the day and included counter piracy focused events such as a boarding exercise with USS Bulkeley’s visit, board, search and seizure (VBSS) team, the U.S. Coast Guard’s advanced interdiction team (AIT) 5, and Japanese and South Korean boarding teams. Other events included medical training, flashing light signalling, search and rescue, and deck landing qualifications. All units involved gained valuable experience to increase readiness when facing an actual piracy scenario. CTF 151 is one of three task forces operated by CMF. CTF 151′s mission is to disrupt piracy and armed robbery at sea and to engage with regional and other partners to build capacity and improve relevant capabilities in order to protect global maritime commerce and secure freedom of navigation.